Yummy Game Day Hot Dog Bites are easy to make and a winner with everyone. I’m well aware January is an important month for football, and with that comes the need for serious munchies. This is the time when stadiums are built using sandwiches, dips and pretzels and billions of chicken wings will be sucked clean. Game day food has to be easy and quick to make and my hot dog bites are exactly that. 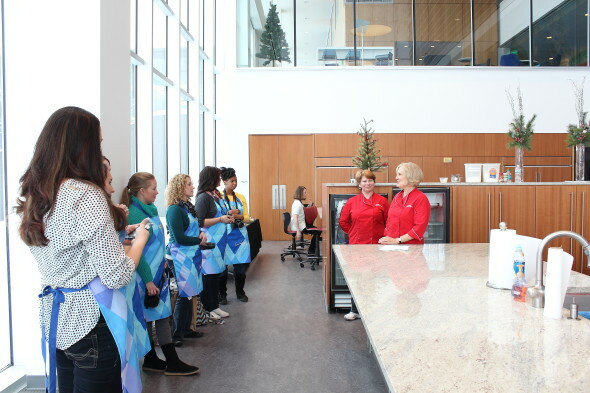 Before I get into the unbelievably easy recipe for these hot dog bites, I wanted to share some pictures of my recent trip to General Mills and their Pillsbury test kitchen in Minneapolis. I was pretty excited when I saw my invite to go and bake in the Betty Crocker kitchen. I was not excited when I saw the temperatures forecast for my time in Minneapolis! Luckily all of our time was spent touring the facility, eating, meeting some amazing Pillsbury staff, eating and… more eating. Our plan for the day was to split into two groups. 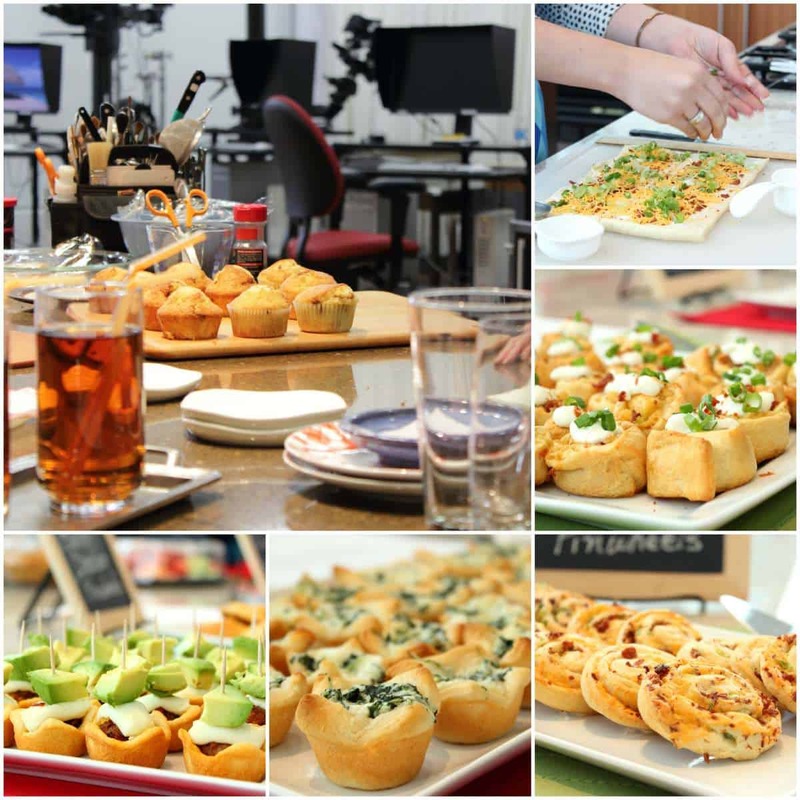 While one group played in the kitchen, the other group took a trip to the photography and food styling department. I love to cook and bake but listening and watching the experts share photography and styling tips and tricks did it for me. Everyone was so friendly and accommodating at Pillsbury and I had an amazing time! These are just some of the appetizers and desserts we made in the kitchen. We broke off into groups of two and myself and Emily from Sweet Bella Roos made bacon cheddar pinwheels. We pretty much rocked the pinwheel section! 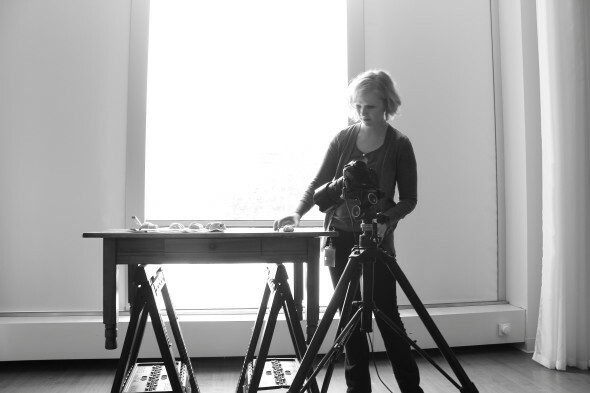 Watching some shots being taken with natural light streaming in from giant windows and being uncontrollably jealous of all the props and equipment available at a moments notice. 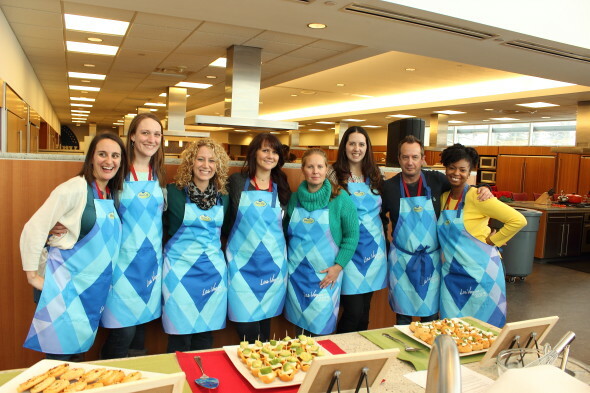 This was a group shot of some of us in our Pillsbury Bake Off aprons which had been designed for the 2013 competition in Las Vegas. That’s me second from the right…just in case you were weren’t sure. It was an amazing trip and I can’t thank Jess, Serena, Kate and all the rest of the staff enough for making us feel so welcome. It was also a pleasure to meet so many new bloggers! Now let’s talk about these Mini Hot Dog Bites. I made these easy appetizers using Pillsbury Flaky Biscuit Dough. Remember I said game day food should be easy and quick to make, well these really couldn’t be any easier. They only have 3 ingredients and one of them is the egg for glazing the top of the dough, so I’m not even sure you could count that. Serve these hot from the oven with a choice of dipping sauces, but you better have some back up because they’ll go fast! Try these other perfect game day finger foods! Preheat the oven to 375 degrees F. Lightly grease a 13 x 9 inch baking tray and set aside. Take one biscuit and using a rolling pin, roll it out into an almost rectangle shape a little bigger than the size of a hot dog. Place the hot dog on to the biscuit and roll it up tightly inside the biscuit dough. Set aside until all of the hot dogs have been rolled up. Take each log of dough and glaze with the beaten egg. Using a sharp knife, make 5 light diagonal cuts along the log. 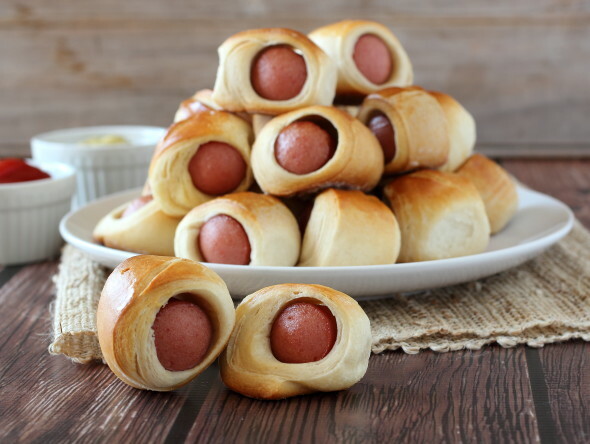 Slice the dough after each cut you just made, giving you 5 individual hot dog bites per log. Transfer the bites to your baking tray and bake in the oven for 20-25 minutes and golden brown on top. Great super bowl bite idea! Great idea and so quick! love appetizers for any time especially game time and your mini hot dogs are a sure hit! So glad you had a great time! Looks like a fun trip and these little bites couldn’t be easier, you’re right! Perfect for game day eats! How fun are these? I am pinning right this second. 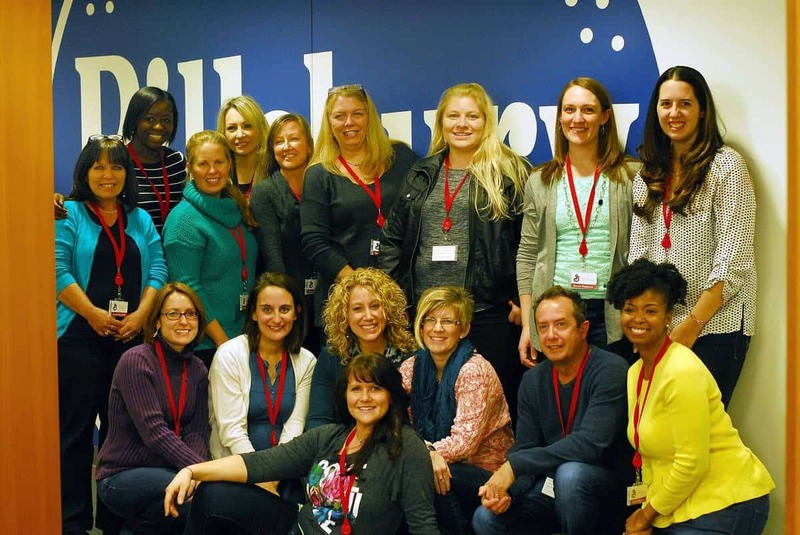 Wasn’t the blogger event so awesome? So glad I got a chance to meet you. These hot dog bites look fingerlickingly good! Totally perfect for game day and your pics are stunning! Pinned! This is definite football food, Gerry! I love these!! It was such a fun trip, and I am so glad I got to meet you. 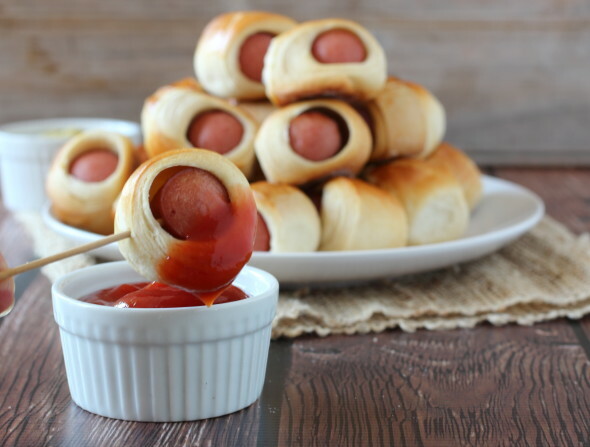 These little hot dog bites are perfect game day food! 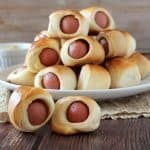 These hotdog bites look perfect for the super bowl and so easy to make! Love easy recipes so we can concentrate on the game. Your trip looks amazing. Note: This site does not allow negative stars. 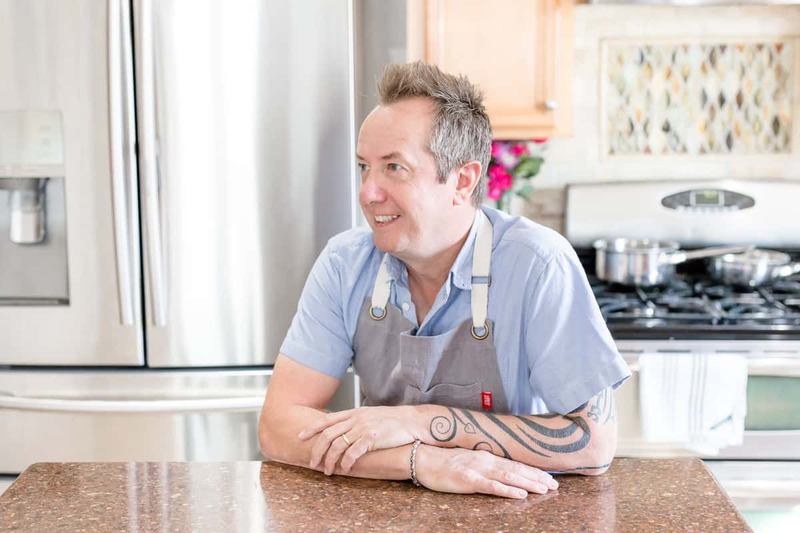 Why didn’t you just say up front it was going to be a challenge to wade through your Pillsbury advertisement and other commercials to get to one of the simplest of recipes ever posted on the internet? Your ste is convoluted and intentionally makes it difficult to get to the actual recipe. I will be using your site as an example of “click bait” to avoid. I am annoyed to think Pillsbury, whose products My family has literally trusted for generations, paid you for an endorsement. Obviously, they have not visited your site and tried to view one of your recipes. you do know that if you scroll to the bottom of the page, the recipe is right in front of you…for free?